In this app note we will show you how to equalize a surround sound or home theater system using the miniDSP 10x10 Hd. This unit has eight channels of analog input, eight channels of analog output, one stereo digital input, and one stereo digital output. Whether you have a traditional 4.0 quadraphonic surround sound setup, a 5.1 setup, or a 7.1 setup, the 10x10 Hd will fit into your system. 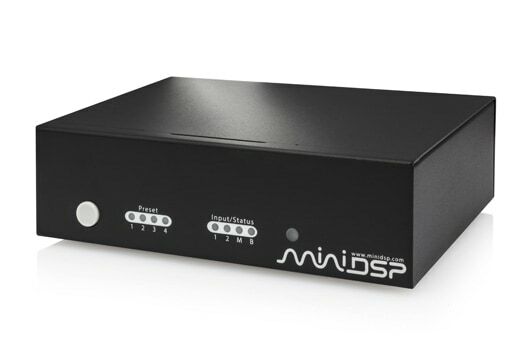 A miniDSP 10x10 Hd. Alternatively, if you are into DIY, you can use the 8x8 kit. The miniDSP 10x10 plugin software. Room EQ Wizard (REW). Be sure to download the latest version from the Downloads Area for UMIK-1 support. Note: if you already have a measurement microphone and/or measurement software, those can be used instead of the UMIK-1 and REW. The auto-EQ function will only work on REW though. The diagram below illustrates the setup used for acoustic measurement. Typically, running the computer measurement signal through the 10x10 Hd will require disconnecting the analog connections from the source and connecting the computer output to the appropriate 10x10 Hd input. In the above example, we also set the digital inputs to pass through to the left and right output channels, which is appropriate if you wish to play stereo content through the digital input. Use REW to measure the in-room frequency response of each of your speaker and subwoofer channels, one at a time. Position the microphone at the center of the listening area, and for best results and consistency, point the UMIK-1 towards the speaker being measured. Performing this baseline measurement ensures that your setup is ready to proceed with equalization. In some cases, the baseline measurements may reveal issues that will need to be corrected before proceeding. Remember also that the subwoofer response will vary a lot with the location of the subwoofer. Experiment with different subwoofer locations in order to get the best response prior to equalization. You may also wish to try making additional measurements with the microphone in different locations around your seating area. This is a "sanity check" so that you can understand how the frequency response varies around the lsitening area. It can help you to ensure that you are not equalizing for issues that vary a lot over the seating area and are not "over-equalizing." For the speaker channels, you may be interested in trying manual equalization, where you set the EQ settings directly in the user interface. It is more time-consuming but gives you more control over the final result. You may find that the left and right speakers measure a bit differently. In that case, you will need to pick a compromise. Overall, you are looking to get to an in-room curve that is reasonably smooth, and is consistent between all speakers. The in-room curve should typically have a gentle slope down in the treble (sometimes called a "house curve"). Avoid using boost filters (filters with positive gain). As a general rule, negative gain is preferred as it ensures that clipping will not be introduced. If boost filters are used, they should have a fairly low Q (1 or less) and a moderate amount of gain (4-5 dB max). Don't try and use a narrow boost to fill in a deep notch in the response. View measurements at 1/3rd or 1/6th octave smoothing as a general rule. Switch to 1/12th octave smoothing to check that you are not attempting to correct a narrow peak with a broad filter. Even with negative gain, use high-Q filters (Q>4) carefully if at all. For more detailed information on bass management and how to apply it, see the related app note Bass management with the nanoAVR. Be aware that summing multiple channels can potentially cause clipping of the signal. If you detect clipping, reduce the input gains and if necessary, increase output gains on selected channels. More advanced routing configurations than those described so far can be set up in the Routing matrix. There are dozens if not hundreds of possible combinations, so we will illustrate just a few here. To send low-frequency signals from other channels to these subwoofers (for bass management), turn on the routing to those subs as described above and add high pass filtering as appropriate. You can of course combine this with bass management by sending some of the input channels to the subwoofer output channel. Note also that in this example, the left and right rear inputs (if used) are routed to the left and right surround outputs.